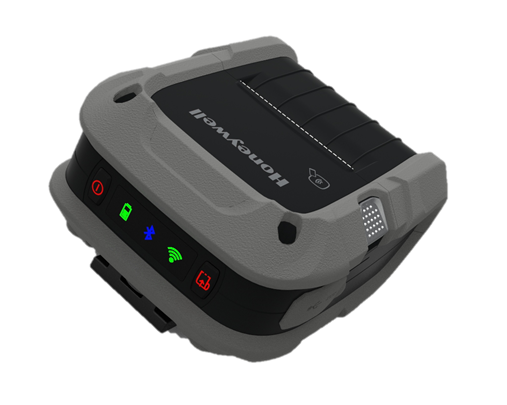 With the RP Series from Honeywell you get robust label printers for mobile usage which offer high robustness and a long battery life. The RP Series produces receipts, tickets and even labels which are either 2 inches (RP2) or 4 inches (RP4) wide. The mobile printers print at 203 dpi (8 dots/mm) at up to 127 mm per second. The RP Series is particularly suited for printing all types of invoices which are needed on the spot (for example, tour reports of freight forwarders, receipts of delivery services and much more). Durability is at the top of the list. Certified according to protection class IP54, the RP Series is robust enough to withstand falls up to 2 m in height and afterwards still reliably produce labels. The printers also withstand extreme climatic conditions from -20° C to +55° C, and media changes are carried out from the top at any time. The user hardly needs time for this, which increases operating times. The battery change is also very user-friendly: thanks to the hot-swap technology, the printer lasts up to 120 seconds without a battery, does not lose its connection and a restart is also not necessary. Withstand drops from heights up to 2M.